Reported in [Spirit Daily.com] online newspaper. His name is Ferdinand Roccanti. He used to be a multimillionaire. He used to be in trouble with the law. He is now an evangelist. It was in 1992 that he traveled for the first time to the apparition site of Medjugorje and there witnessed what he describes as a huge manifestation of the Virgin Mary. 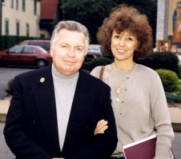 Once a car dealer in New England and then Florida, where he amassed a small fortune of $5 million, Roccanti and his wife Barbara were going up Apparition Hill on September 12, where one of the seers, Ivan Dragicevic, was to receive a message. "Barbara had some candles and we climbed Apparition Hill and I knelt by this pile of rocks where they said Mother Mary first appeared -- not to think that she was going to appear, but just because it seemed like the place to kneel -- and at nine o'clock we started to pray," he says. "It was dark and I prayed this prayer, I don't even know where it came from: 'God, God of Abraham and Jacob and Isaac and Moses, do You know I'm here?' "I had my head bowed and my hands folded together in prayer. I didn't see this hand but I felt a hand come under my chin and lift my head up and the heavens opened and He sent His mother. When I say the heavens opened up, it was daytime to my eyes. She was all white and as big as the heavens.I went to point my finger up and say, 'Look!' but my hand froze halfway and now I couldn't talk. I couldn't move my hand, I couldn't talk, and I couldn't take my eyes off her, so I touched my wife with my left hand and I could only whisper. When I touched her she looked and in a whisper I said, 'Look up and tell me what you see,' and she said, 'I see her!' Mother Mary didn't talk to either one of us, but there was something that happened deep in our hearts and souls that would change our lives forever. I really believe that once you see the Mother of God -- I don't know how someone could describe something so incredible." When Ferdinand told a priest, the priest later heard the exact same testimony from another pilgrim. Flying back, Ferdinand was sitting on the end of the fifth seat on the middle row of a plane when a woman, another pilgrim, came and sat on the arm of his seat as the flight attendant was wheeling a cart in the area, reached in her purse, pulled out a Pieta book, and put it in front of his eyes, asking, "Have you seen her?" The question was a shock. It had come out of the blue and was a confirmation to Ferdinand, who says the Virgin he saw on Apparition Hill did look "a little bit" like the picture, "but she was as big as the heavens, enormous. And when she left there were these shooting stars. I thought everyone had to have seen it, but nobody did but Barbara and one other person. It was a white or light-blue sky like heaven's light. And it was just her face." For Barbara, it was similar. "The sky was pitch dark, we could hardly find our way up the mountain, but when the vision appeared, I saw her face and it looked all white and she was up in the sky and it was just huge and when I looked down and looked back she was still there," Barbara recalls. "She was sort of transparent and all white and all bright. It was very clear." Now my mind is racing. This is the worst news I've ever heard, so I cried more. I'm choking, crying. I could not say yes. Everyone laughs when I say it, but I wasn't laughing. I was crying like a person who just lost his whole family. My mother was really upset. I was crying and choking. She thought I'd die. But Mother Mary came and said, 'Take a tear and touch your mother's arm.' My mother became calm, and she had been really hysterical. I touched my sister and wife also and they became calm and relaxed like on a sunny day. Mother Mary said, 'Little Ferdinand, I'm giving you my heart,' and I felt this incredible infusion of power and I said, 'Jesus, do with me what You want.'" It was then that the former car dealer developed ailments that indeed temporarily took away his sight and sent him into a wheelchair. It was a neuromuscular disease called myasthenia gravis. He went blind on September 16, 1994, and a month later -- on October 13, 1994 -- experienced another vision, this time of Mary as Our Lady of Fatima. 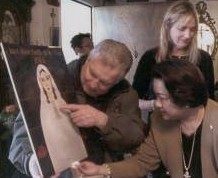 She also appeared to him during 1993 in St. Peter's and Paul's Church in Chicago. As for the money, by now this businessman who had once sold BMWs and Volvos had about $1.4 million left and began to give this away "to whoever Mother Mary lead me to"  individuals, churches. He bought new cars for people. He kept only enough to pay a fine he owed over a financial transaction (which had sent him seeking refuge at Medjugorje to begin with), buy a small house, and pay legal fees. For a long period he and his wife traveled, living out of the trunk of their car. Today he relies on selling inspirational paintings. This was another miracle for a man who didn't previously know how to paint! Before a talk at St. Michael's College in Vermont, dozens of evil spirits attacked, Roccanti told Spirit Daily. "I was punched, threatened, and bounced around the room," he says. "I would spray them with Holy Water and you could hear it like a sizzle." And in this too is a message. "Every time you pray a mystery of the Rosary, you hit the devil right between the eyes, and in these times that we're living in, you need to hit him 15 times," urges Ferdinand. "Because if you whack him in the forehead with those mysteries, by the end of the day he's dazed and he can't get you. But he'll start again tomorrow if you don't pray." Now a resident of Grange, Indiana, Roccanti feels the United States will suffer for next four years. On September 11, while in church, he says Jesus spoke to him, repeating a sentence three times. "He said, 'This is the beginning of the punishment against the killing of the innocent,'" recalls Ferdinand. "'This is the beginning of the punishment against the killing of the innocent.' He said it three times. Some people don't want to hear it -- you know, 'God wouldn't do this.' And I say, well, the God Who sent the serpents into the desert to kill the Israelites because they were disobedient is the same God." [See here] image of painting Ferdinand did titled Our Lady of Compassionate Protection that wept Rose scented oil.